Gerald and Margie Rizza purchased their 47 acre property in the mid 1970’s. They planted about 4 acres but didn’t make wine until 1988, the year the winery was bonded. Gerald made the wine and Margie looked after the tasting room. The winery was located in a large building constructed of slumpstone. Most of the wine made was Pinot Noir and Cabernet Sauvignon, and sold from the tasting room. The wine was labeled “Rizza Cellars”. How long the winery stayed in business isn’t known. 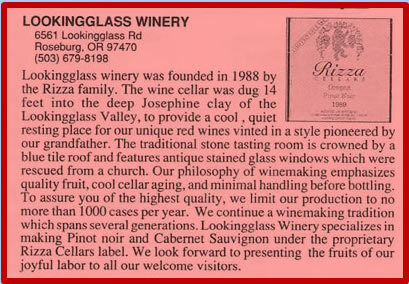 The winery was named Lookingglass, taken from the nearby town of Lookingglass, near Roseburg in the Umpqua Valley. The Umpqua Valley is often called the “Hundred Valleys of the Umpqua” referring to the many sub valleys formed by the regions complex topography.